This colorful Easter collection arrives with an assortment of sweets which includes mini Butterfingers, Welch's fruit snacks, Air Heads candy, M&M's milk chocolate, Popcornopolis unicorn popcorn, Skittles, Twix and Snickers Easter egg. 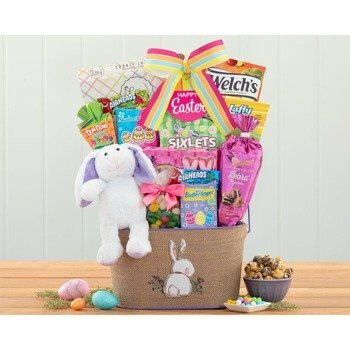 Kids will enjoy and have fun with colorful Easter gift basket. * I found it useful because I could buy from Brazil. I found 1stinflowers after several attempts to buy from overseas. The whole process was quick and easy going.